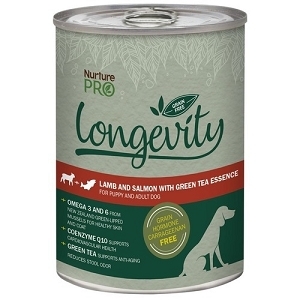 Made with premium New Zealand meats and Omega-rich Green Lipped Mussels, Nurture Pro Longevity dog canned food aims to provide dogs with wholesome grain-free recipes that tap into the finest qualities of nature to support pet health while providing them with ample vigour for everyday adventures. 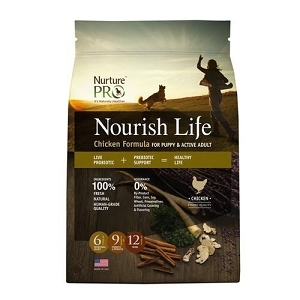 Featuring the clean cuts of free-ranging New Zealand Chicken, this low-fat yet high-protein formula provides nourishment of a higher nutritional density for dogs that need that extra boost of energy for daily activities. Apart from contributing to blood cell production, Iron from Chicken Liver is essential for muscle and neural function and it helps to prevent lethargy. 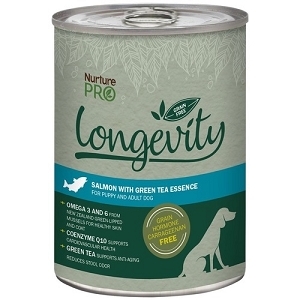 Longevity Chicken with Green Tea Essence is perfect for active dogs living the energetic lifestyle. 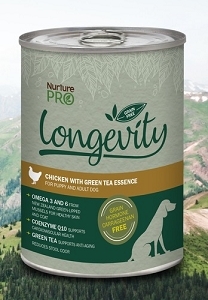 New Zealand Hormone Free Chicken, Broth, Chicken Liver, Pumpkin, Ovine Plasma, Brewers Yeast, Sunflower Oil, Mussel Powder, Agar Agar, Cassia, Potassium Chloride, Vitamin A, B1, B2, B3, B5, B6, B12, Vitamin E, Iodine, Folic Acid, Biotin, Organic Copper, Organic Manganese, Organic Selenium, Organic Zinc, Organic Iron, Calcium Carbonate, Guar Gum, Green Tea Powder, Yucca Schidigera, Choline Chloride, Coenzyme Q10.